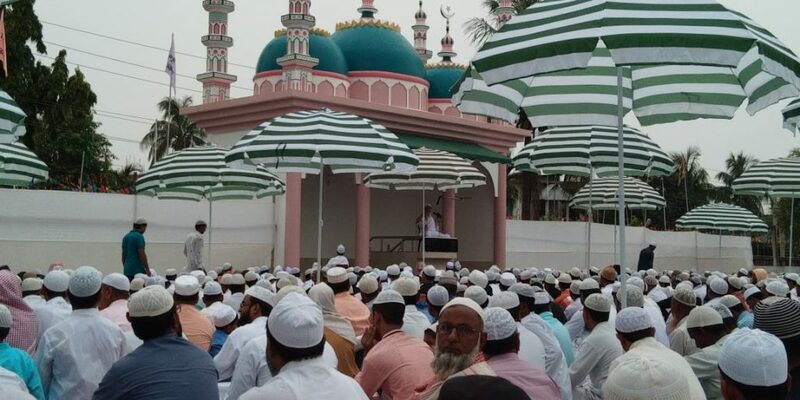 Eid Ul-Fitr, was celebrated in Hojai District with solemnity, along with the rest of the world. Eid Ul- Fitr marks the end of the fasting period of the Islamic month of Ramadan and ushers in the month of Shawwaal. Thousands of Muslims joined the celebration of Eid-Ul-Fitr at Hojai Eidgha Maiden, Nilbagan Eidgha Maiden, Daboka Eidgha Maiden, Udali, Jugijaan, Murajhar, Gopal Nagar, Kapasbari, Lanka, Lumding on Saturday. Although flash flood has affected the celebration in many parts of the district the fervour of Muslims has not dampened. For Muslims, Eid Ul-Fitr is not only the sign of breaking the fast, it also signifies the attainment of communication with the divine spirit and religious virtue, characterized by sacrifice, self-discipline and acts of charity. Many Muslims attend prayers and listen to a Khutba or sermon on the first day of the month of Shawwal, in every corner of the district. There has been a belief that if a Muslim has not given Zakat al-fitr during Ramadan, he or she can give this on Eid-al-Fitr. Zakat al-fitr is a form of charity consisting of a quantity of food, such as rich, barley, dates, raisins or wheat flour, or its monetary equivalent given to the poor. Many Muslims also prepare festive meals to share, wear new clothes, visit relatives and give gifts or chocolates to children. Hojai Markets were thronged by children’s enjoying the festivity, purchasing varieties of food, sports items.